I have about 300k plus the sale of any players from that squad to put a legend in, who would you go with? It s already a great team! Only players that can be change are baines and benatia, not the best at their positions. I was thinking maybe the defence, I don't have that much time to play these days so I don't need two squads anymore so I thought I would go for one elite team. Hows that team play mate? I'd have to change keeper then which would free up even more coins! 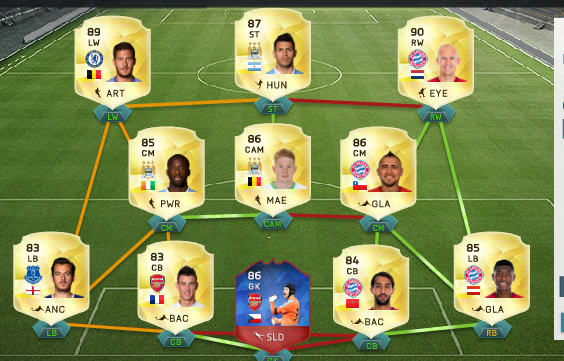 That would affect Aguero's chem though. My bad. Didn't even realise Brehme was that highly rated, I'll probably go with him. Is 380-400 a good price for Brehme? Do you really wanna spend 400k on an LB though? Me either really, but 400 on an LB seems a waste to me too! What about changing Yaya to Litmanen or something? Or sell the right side and get SIF Bale? Or a TOTY player?